Last Saturday morning, the Foothill Gold Line Construction Authority hosted a groundbreaking ceremony celebrating the start of construction on the next phase of the Foothill Gold Line. The new Gold Line “phase 2B” extension will run 12.3 miles east from Azusa, extending from Glendora to Montclair. It will include six new stations, one each in the cities of Glendora, San Dimas, La Verne, Pomona, Claremont, and Montclair. The groundbreaking ceremony commemorates the beginning of construction on a relatively small portion of the phase 2B extension. The authority has split the extension into two design-build contracts. This initial phase underway is called the Utility Relocation Contract or DB1. At about $3 million, this contract represents less than one percent of expected overall contracted construction expenditures. The second phase, called the Alignment Contract or DB2, is anticipated to be awarded in October 2018. The Alignment Contract, estimated around $700 million, includes final engineering and construction. Construction is anticipated to be completed in early 2026. The Gold Line extension is billed as “the first Measure M-funded rail project to begin construction.” Though it is off to a promising start, it does, however face some likely-minor wrinkles before proceeding with full-scale construction. Metro’s downtown L.A. Regional Connector subway would love for its issues to be as minor as the Gold Line’s are. Gold Line phase 2B is complicated by crossing a county boundary. Though the extension is nearly all in Los Angeles County, the Montclair terminus station will be in San Bernardino County. Many transportation funding sources, including sales tax Measures M and R, are limited to the county where the funds were raised. Though earlier Foothill Gold Line segments have been built on existing rail rights-of-way, the next extension is the first time that the new light rail will share right-of-way with other active rail, both freight and Metrolink. Though the new Gold Line tracks and stations are separate from heavy rail stations for Metrolink, the shared right-of-way makes for a more complicated project, as in one that is more expensive and takes longer to build. For the Alignment Contract phase of the project, the first two years will be spent moving the active heavy rail tracks to make way for later light rail system construction. 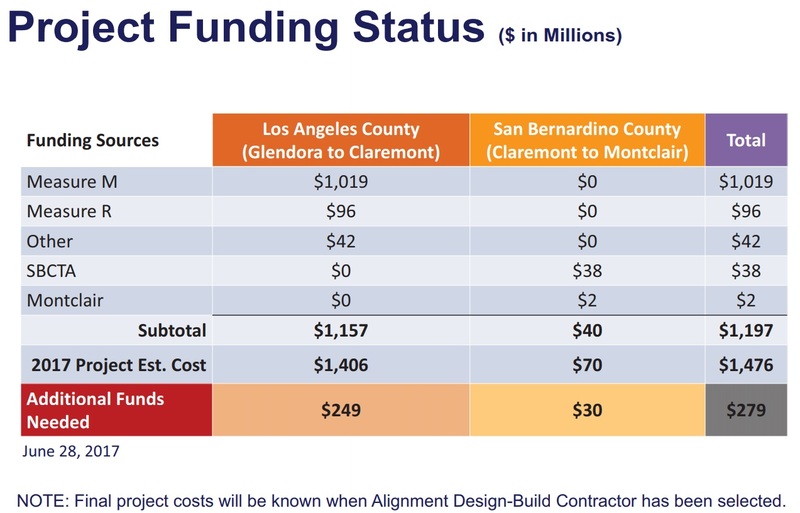 The costs for the Glendora-to-Montclair extension have been creeping upward. As of mid-2016, the cost was estimated at $1.2 billion. In mid-2017, it was up to $1.37 billion. Now the construction authority is estimating $1.476 billion. The new extension has about $1.2 billion in funding approved in L.A. County Measures M and R, plus some additional funding, but it currently faces a shortfall estimated at $279 million. Though project designs were basically finalized during environmental studies in 2013, the current shortfall has prompted some discussion of how the project scope might be modified to save money. Prominent in these discussions are parking structure costs and the possibility of eliminating Metrolink’s Claremont station. In September, the Metro board approved studying how the Gold Line extension and parallel Metrolink can best complement each other. One of the big issues that this study is wrestling with is the possibility of eliminating the city of Claremont’s Metrolink station. Due to the constraints of right-of-way geometry, current Gold Line plans call for demolishing and relocating the Claremont station. Metrolink stations at Pomona, Claremont, and Montclair are bunched together in a stretch of less than four miles. Eliminating the Claremont station would speed up Metrolink trains, and would reduce Gold Line construction costs. 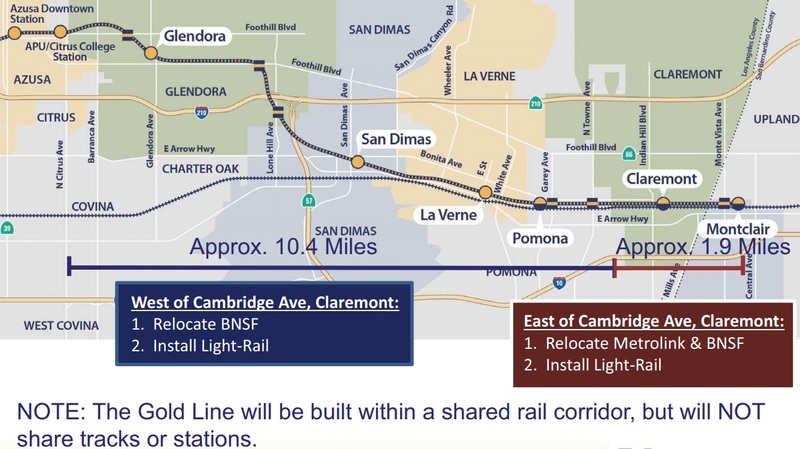 Though fewer and farther-spaced commuter rail stops makes a lot of regional transportation sense, it is opposed by Claremont leaders, as it would mean Claremont residents would need to travel a couple miles further to board Metrolink trains. Another potential cost-cutting measure could be reducing planned new station parking. 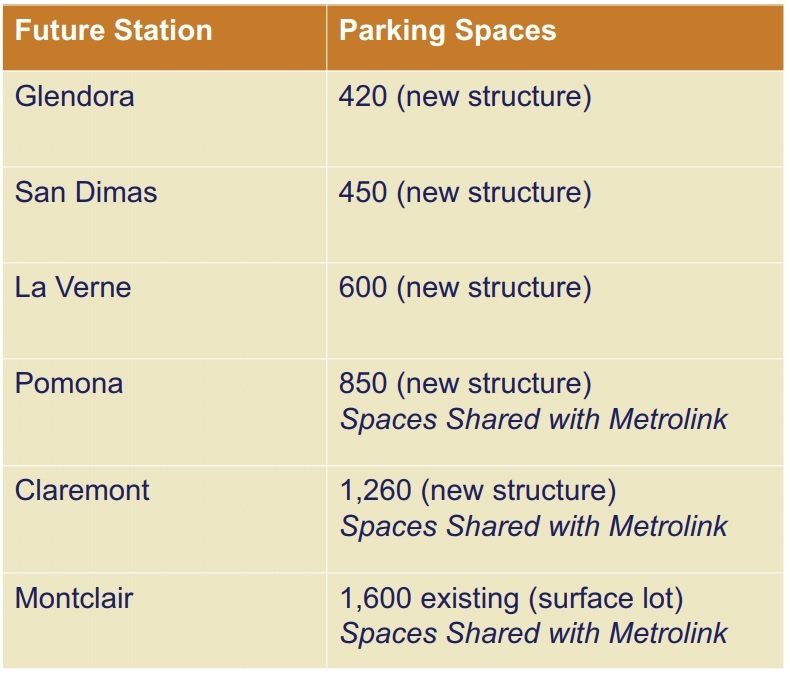 Expensive parking structures are planned at all five new L.A. County Gold Line stations. The 3,580 new spaces would cost an estimated $86 million, using Shoup’s average cost of $24,000 per space in parking structures. That overall parking cost represents more than a third of the project’s $249 million L.A. County shortfall. In addition to up-front construction costs, building parking structures has opportunity costs – it precludes future possibilities for station-adjacent land, including transit-oriented development. The phase 2B parking structures were planned during the 2013 environmental clearance studies. At that time, Metro’s practice was to offer as much un-managed free parking as possible at station park-and-ride lots. In 2015, an audit showed Metro’s free park-and-ride practice was harmful to low-income riders and the environment. Since then, Metro has implemented efforts to better manage parking. At high-demand station lots, Metro prevents non-riders from taking up spaces, and has begun charging for parking. These parking management efforts have resulted in more spaces more dependably available for Metro riders – as well as reducing Metro’s expenditures on constructing, operating and maintaining the agency’s 24,000+ parking space inventory. The excessive parking slated for the Gold Line phase 2B recently came into question as part of Metro’s in-process Supportive Transit Parking Program Master Plan, a year-long study anticipated to go to the Metro board for a vote in January. The parking plan’s appendix F states that newer modelling predicts “a need for fewer parking spaces than envisioned in the Environmental Impact Report for the [Gold Line 2B] project.” Appendix F is described, though the analysis and estimates referenced are not included, in the draft plan available online. At the parking plan discussion at the November 15 Metro Planning and Programming Committee (audio – item 14), the new Gold Line 2B parking estimates raised concerns among future Gold Line cities. At that meeting representatives from Glendora, San Dimas, Pomona, and Claremont all urged the Metro board to build the expensive parking structures, including some criticism of possible “dramatic parking reductions” as “flawed” and based on “faulty assumptions.” In response, Metro staff defended the possibility of reducing planned parking as a way to bridge the funding shortfall, though the staff also said that Metro would need to honor any previous legal commitments to cities. In order to keep the new Foothill Gold Line extension on track to proceed with a late 2018 go-ahead for full-scale construction, the final project scope will need to be resolved in early 2018. The Metro board will either need to secure additional funding and/or reduce costs. It makes local sense for host cities to push to keep their local investments at a maximum, but something needs to give. Given the current funding shortfall, insisting on the full 2013 plans could result in delaying project construction and completion – something none of the host cities want. Host cities may need to compromise for the greater good of making sure construction can proceed. The Metro board needs to weigh the regional and local needs to arrive at a fully-funded phase 2B budget in the next couple months. The complicated negotiations may come to a resolution at the January Metro board and committee meetings where both the Gold Line/Metrolink study and the parking plan are scheduled to be discussed. Congratulations to Metro and to the Foothill Gold Line Construction Authority for breaking ground on the new phase. Additional coverage of Saturday’s celebration can be found at the San Gabriel Valley Tribune, Urbanize, The Source, KPCC, CBS, ABC, and the L.A. Times. Additional photos of the event are available at the Construction Authority’s Facebook page. Claremont station is surrounded by housing, a downtown and a collage. Montclair station is surrounded by parking and boxes. Keep Claremont, remove Montclair Metrolink.